Growing Garden Flowers from seedlings and seeds is a great way to create a stunning colourful garden. Garden flowers like all plants have a range of requirements unique to individual plant species. Soil, temperature, moisture and light all play a role is determining which flowers will grow successfully in your garden. Flowers in the garden are a great attraction. 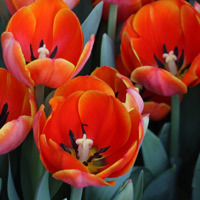 So if you are growing flowers in the garden for a floral display or as a source of cut flowers www.nurseriesonline.co.uk has information on how to grow flowers as well as where to source some of the best flowering garden plants in the UK. All the information you need to start gardening with flowers. We also have a range of articles on free gardening tips and advice. Early Spring is the time to plant many flowering plants and proper soil preparation is essential if you are to grow successful flowering plants. Garden beds can be, weeded, turned and cultivated as soon as the rains begin to ease. Soil needs to be allowed to little dry a little before cultivating otherwise soil structure can be damaged, in wet areas consider raised garden beds to improve drainage. Well rotted compost, animal manure and fertiliser can all be added before planting. Organic matter improves soil structure and helps to break down clay soils. Remember that some plants prefer acidic soil, other alkaline soil, test your soil with a ph testing kit to determine the type of soil you have and what additives may be needed to adjust ph. A - Z plant Finder - Hundreds of flowering plants with links to nurseries in the UK. Garden Shows and Plant Fairs are a great way of finding plants that are a little unusual, and in many cases cheaper. How to build a raises garden beds for flowering plants. Perennial Plants and Bulbs for the flower garden. Plants that flower and then die back only to come again the next year are referred to as perennial plants. With careful selection it is possible to have perennial plants providing flowers from early spring right through to autumn. Plants that are grown from seed, flower and set seed but then then die are referred to as annuals. Annuals can be grown from seed collected from your own garden or purchased from online suppliers. Annual can also be purchased as bedding plants. 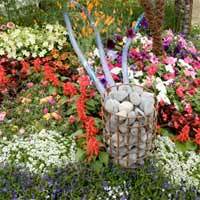 Include: Amaranthus, Aster, Dicentra spectabilis (Bleeding Heart) , Allium, Strelitzia, Campanula, Carnation,Hydrangea, Lilac, Lisianthus, Orchids (some species), Peony, Alstoemeria, Primrose and Salvia .